The Howard Hughes Corp. unveiled last night, in true Las Vegas fashion, the new mascots for the Las Vegas Aviators: Spruce and Aviator. 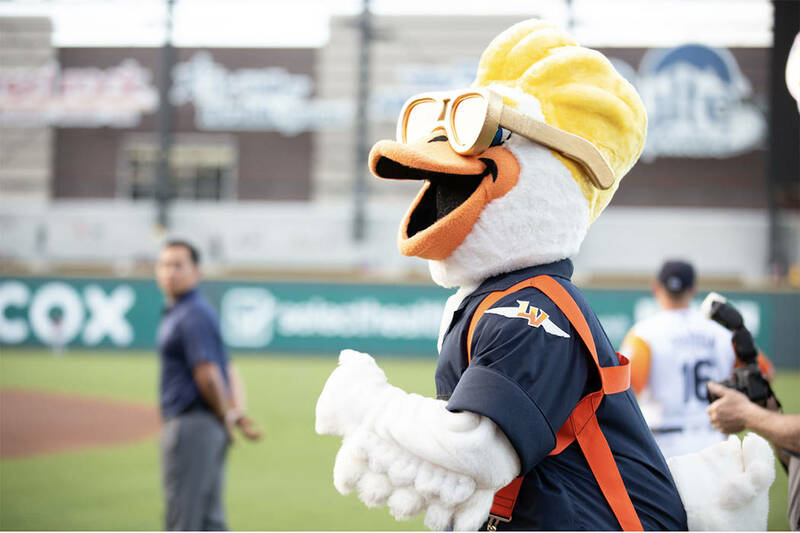 Created expressly to illuminate and celebrate the team’s new aviation-themed moniker, the mascots made their Southern Nevada debut on April 9 at the season opener and first-ever game to be played at Las Vegas Ballpark. The Howard Hughes Corp. unveiled last night, in true Las Vegas fashion, the new mascots for the Las Vegas Aviators: Spruce and Aviator. 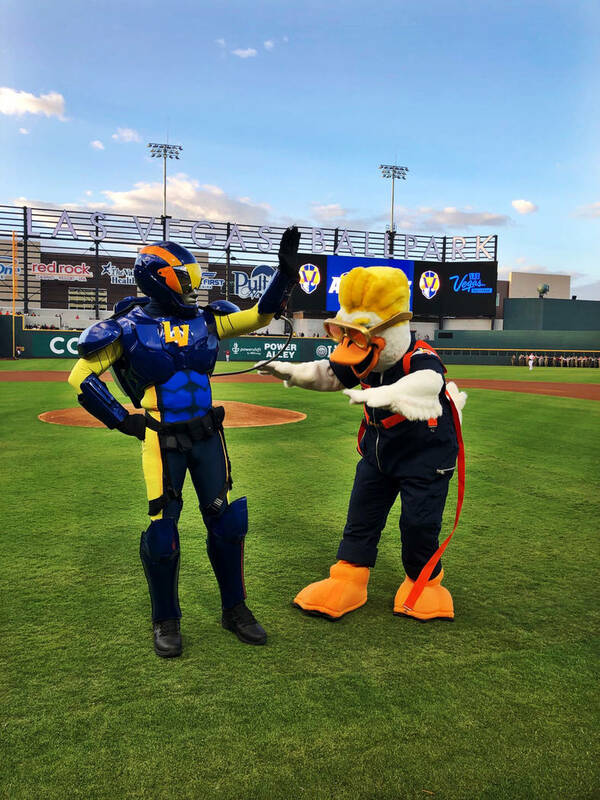 Created expressly to illuminate and celebrate the team’s new aviation-themed moniker, the mascots made their Southern Nevada debut Tuesday at the season opener and first-ever game at Las Vegas Ballpark. “With a new name, a new ballpark and a new affiliation with the Oakland Athletics, the Las Vegas Aviators have launched an exciting new chapter in the team’s 37-year history as the city’s oldest professional sports team,” said Don Logan, president and chief operating officer for the Las Vegas Aviators. Spruce is a goose who lived in the Bellagio fountains as a gosling. From an early age, he was involved in show biz, as his parents were part of a magic act on the Strip. In his new role as the Aviators’ mascot, he is thrilled to be following in their entertainment footsteps. One day when he was old enough to migrate, Spruce set off with his family but quickly realized he wasn’t a great flyer. Looking for a soft landing, he spied the outfield pool at the Las Vegas Ballpark and decided to call it home. His new friends named him “Spruce” after the Spruce Goose, the nickname of Howard Hughes’ H-4 Hercules aircraft, which flew just 70 feet above Long Beach Harbor before landing on the water. Spruce now lives at Las Vegas Ballpark full-time and dreams of being a great flyer and adventurer like his hero and fellow mascot, Aviator. He will do anything to impress him and even dresses like him but can’t seem to get it quite right. True to Spruce’s roots, he is a larger-than-life character who is always getting in over his head. His aim in life is to fly again one day, and hopefully the Las Vegas Ballpark fans will give him the uplift to get off the ground! His favorite food is the Hungry Hotshots Kids Meal at Las Vegas Ballpark, and his favorite film is “Top Gun,” of course. While Spruce is an open book, Aviator is a bit of a mystery. 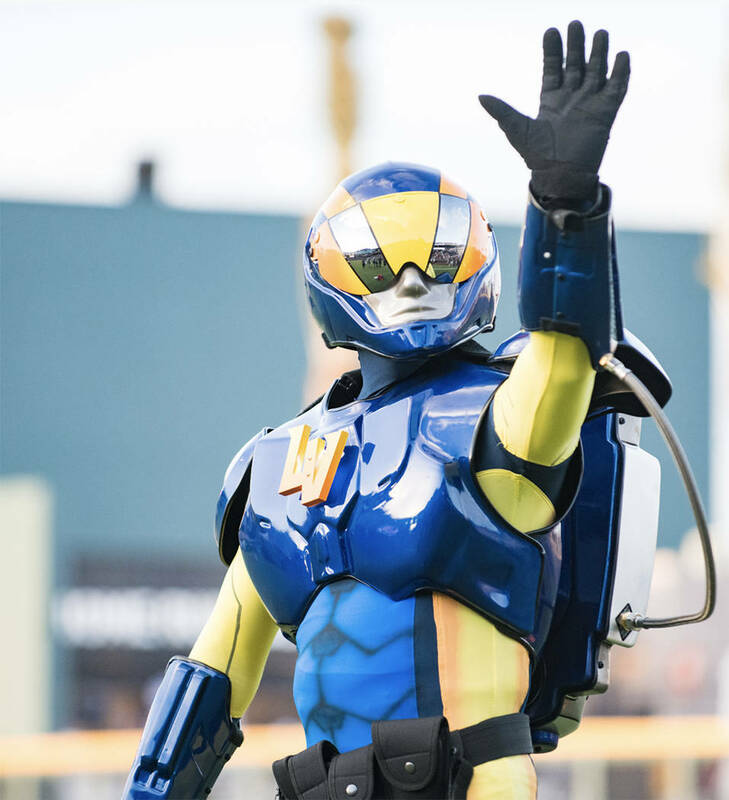 No one knows exactly where he came from or how he ended up at Las Vegas Ballpark, but his flight suit and gear are really out of this world, suggesting he has had some pretty fantastic adventures and seen some astonishing places. Rumor has it Aviator is an ex-pilot once stationed at Nellis Air Force Base, where he was testing the top secret Intergalactic Jet Propulsion System, which appears on his flight suit. He is still engaged in classified missions, and, for this reason, he can never reveal his true identity. Aviator loves helping young flyers to get off the ground and achieve the impossible. So much so, he has taken Spruce under his wing and will try every trick in the book to get his friend airborne. Aviator is completely focused on Spruce, the team and the fans and never leaves a squad member behind. Aviator loves The Hercules hot dog, part of the specialty FlyDog collection served at Las Vegas Ballpark. His favorite movie? “The Aviator,” of course! Las Vegas Ballpark, located on eight acres in Downtown Summerlin — just south of City National Arena, practice facility for the Vegas Golden Knights — is the home of the Las Vegas Aviators, the city’s professional Triple-A baseball team of the Pacific Coast League and affiliate of the Oakland Athletics. Las Vegas Ballpark provides a wide range of seating options including 22 suites, club seats, berm seating, party zones and decks, picnic tables, kids’ zone, bars and a pool beyond the outfield wall. Designed to create a festival-like atmosphere in Downtown Summerlin, the site is landscaped to complement the surrounding master-planned community. The site is easily accessed from all regions of the valley via the 215 Beltway. The Las Vegas Aviators have the proud distinction of being the longest-enduring franchise in the history of professional sports in the state of Nevada. The 2019 campaign will mark the 37th season in the Silver State as a proud member of the Pacific Coast League and the inaugural season in the new Las Vegas Ballpark. The Stars (1983-2000) and 51s (2001-18) have reached the 300,000 mark in “home” attendance in all 36 seasons previously at Cashman Field. The Aviators are in their first season as the Triple-A affiliate of the Oakland Athletics, and the franchise won the PCL championship in 1986 and 1988. The Howard Hughes Corp. owns, manages and develops commercial, residential and mixed-use real estate throughout the U.S. Its award-winning assets include the country’s pre-eminent portfolio of master-planned communities, operating properties and development opportunities including the Seaport District in New York; Columbia, Maryland; The Woodlands, The Woodlands Hills and Bridgeland in the Houston area; Summerlin and Ward Village in Honolulu. The company’s portfolio is positioned to meet and accelerate development based on market demand, resulting in one of the strongest real estate platforms in the country. Dedicated to innovative placemaking, the company is recognized for its commitment to design excellence and to the cultural life of its communities. The Howard Hughes Corp. is traded on the New York Stock Exchange as HHC. For additional information visit www.howardhughes.com.